He might be a family man these days, as well as a part-time caddy for his 18-year-old son Zac, but the fire still burns in Andre Stolz’s belly. And while he may also be using a belly putter with great dexterity in recent weeks – scoring an impressive win in the South Pacific Open in New Caledonia last month – Stolz has no qualms about switching back to a short putter when the need arises. Indeed Stolz admits 30 to 40 putters have found a happy home in his Central Coast [NSW] garage. And he frequently plucks one out of the pack, finds it rolls the ball well and gives it a stint in his golf bag. 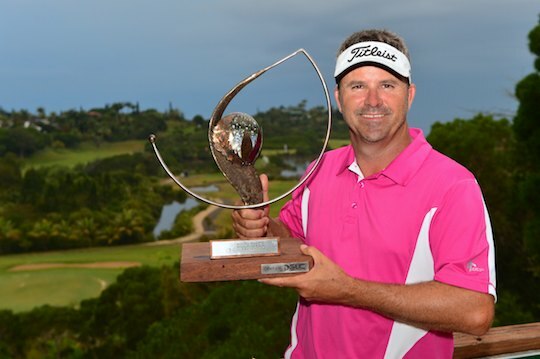 Amazingly Stolz had been winless for almost two years before his New Caledonia win. Now he feels he has the confidence to again be a force on the OneAsia Tour. The 43-year-old Australian is keen to add to career victories on the US PGA Tour, the Nationwide Tour, Japan Tour, OneAsia and the PGA Tour of Australasia. “I feel as if I’ve been around about the mark for the past 12 months or so, but there has just been a few untidy bits here and there,” said Stolz. “The difference is I have started playing the difficult holes really well and that is important at this level. Stolz claimed the OneAsia Order of Merit title in 2011 on the back of victories at the Thailand Open and Indonesia PGA Championship, but had a quiet season last year and made just three cuts with a best of joint 19th at this event. One key to his newly regained confidence has been his putting. “I switched to cross-handed about three months ago and it seems to be working very well for me,” he said.